“Good afternoon. Bonjour. Aanii Boozhoo. I want to start by acknowledging that we are gathered today on the traditional territory of the Mississaugas of the Credit. I hope you all were able to take some well-deserved time off over the holidays to spend with family and friends. I want to thank Caroline for emceeing today’s event. Caroline and I met last year after she received the Harry Jerome Award for Leadership. She grew up in Mississauga and has strong connections to our City having volunteered with the Big Brothers, Big Sisters of Peel and the Mississauga Library’s youth advisory committee, amongst other initiatives. Caroline, I know that you have a very bright future ahead of you. I want to thank our team of committed Councillors who are here today. Our dedicated team always has the best interests of this City at heart. I also want to acknowledge our City’s leadership team, including our City Manager Janice Baker and Commissioners. Nothing we achieve would be possible without the support of our dedicated, professional, and passionate team of staff who are committed to excellence and to serving our residents. I am proud to have the privilege to work with each and every one of you. I’d also like to mention that we have several Mississauga members from both the provincial and federal levels of government joining us this afternoon. Thank you for joining us and being a strong voice for Mississauga at Queen’s Park and Parliament Hill. As we usher in 2019, we have an opportunity to start afresh, to reassess our priorities, and to chart a new course for the next 365 days, and beyond. The New Year is an exciting time brimming with promise and opportunity. As a City, it gives us an opportunity to set the direction and key priorities for Council for the coming year. It also provides us with an opportunity to reflect on the year that was, and look toward the future of our City in the coming year and beyond…. During my time in office, one thing has become crystal clear. Only by working together, will we move Mississauga forward, towards a bright and promising future. 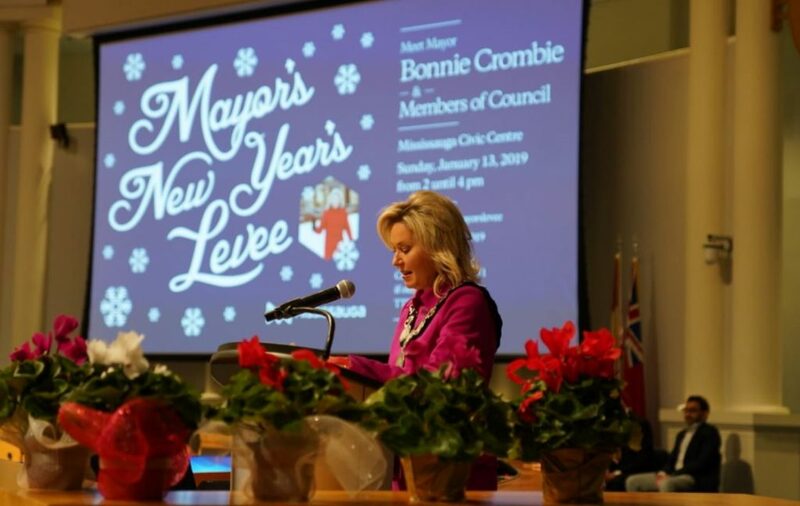 Yes, we will face challenges in the next year and beyond, but rest assured, you have a strong and capable team of professionals who are working in your best interests and are dedicated to moving Mississauga forward. It is our duty, Council and Staff, to write the next chapter of our City’s history and help Mississauga reach new heights. And we want you to be part of that story. There are so many things to look forward to this year. Mississauga is on the cusp of something big. While government plays an important role in city-building, we can’t reach new heights as a City unless we get the fundamentals right. And it starts right here, with all of you. As Mississauga approaches our 50th birthday in 2024, we must ask continue to ask ourselves what kind of city and community we want to be? Mississauga is a welcoming city, where neighbours live side by side in harmony. Our residents lift one another up, not put each other down. We don’t build higher walls, we build longer tables. We are a caring city, a place where everyone belongs and where everyone can grow and thrive. In a world where nationalism is increasingly taking hold, where the fires of divisions are being stoked, and where fear and lies are being used more frequently. We must do more to stand up for our values and reaffirm our commitment to humanity. Mississauga can be a beacon of hope in the world – a place where people from all walks of life can live together in harmony, but more importantly, where people can succeed. Mississauga is the embodiment of what it means to be Canadian. In 2015, when the war in Syria drove hundreds of thousands of innocent families from their homes, Canada welcomed them and provided them shelter and a chance at a new life. Many of these families settled in Mississauga and were sponsored by members of our community. I think of people like Nabil, a young gentleman who immigrated to Mississauga from Syria a few years ago for a chance at a better life. He was able to open his own Syrian restaurant, Roman Zaman, which is wildly successful and might I say, serves some pretty incredible food! Shortly after opening, Nabil actively sought to employ fellow Syrian newcomers because he wanted to give them a leg up and help them kick-start their new lives in Mississauga . This is the true spirit of Mississauga. This is just one story of thousands across our city. I know there are thousands of Nabil’s in Mississauga who are doing their part to make our city an open and welcoming place for all. We are a City that is generous and kind. We are a city where neighbours look out for each other. I see that generosity when our residents stepped up over the holidays to set the table for their hungry neighbours by participating in my City-Wide Food Drive. While our economy is surging, not everyone is feeling the benefits. When one of us is left behind, none of us can truly move forward. Precarious employment is surging, and wages aren’t keeping pace with the cost of living. People are going from gig to gig and lack the stability they need to feel safe, secure and confident in making big life decisions. The gap between the rich and poor continues to widen. There is a hollowing out of the middle class. It is as sad, as it is unacceptable, that 15% of our residents live in poverty. Last year alone, The Mississauga Food Bank received over 200,000 visits from hungry neighbours in our city – that’s an 18% increase over the previous year. This is unacceptable in a city as prosperous as Mississauga. No one should ever have to think twice about where their next meal is coming from. While I’d like to put the food banks out of business, the unfortunate reality is that they are still very much needed. Every year, I do what I can to help feed our hungry neighbours by hosting my city-wide food drive in support of the Mississauga Food Bank. This food drive would not be successful without the generosity of each and every one of you. I am pleased to be joined today by the Executive Director of the food bank, Meghan Nicholls, Fire Chief Tim Beckett and Donnie the Donation Bag, to announce the outcome of our holiday food drive. Our Vietnamese, Muslim, Coptic, Catholic and Chinese communities, among many others, to rise to the challenge and help us reach our goal. I’m proud to be here today to announce that we not only achieved our goal, we exceeded it, raising an impressive $650,300 dollars and 404,500 pounds of food, which brings our total to $1 million dollars and $1 million pounds of food since I started my city-wide Mayor’s Food Drive four years ago. And, that’s more food and funds raised during the holiday drive than ever before! Each year, Mississauga proves once again that we are a city that cares. We are deeply thankful for the residents, schools, businesses and generous community groups who made this campaign a success. I’d now like to invite Meghan up to the podium to say a few words. Chief Beckett, get up here too! While we have achieved our goals during the holiday campaign, the need for food does not decrease throughout the year. If you can, I encourage you to reach into your heart and extend your generosity year-round. How can I contribute to making my community a better place to live? How can I help my neighbours? Small, random acts of kindness can go a long way in making the lives of others better. I challenge all of you to commit a small, random act of kindness each day. Hold a door, shovel a neighbour’s driveway, give someone a smile. Added together, these random acts can make a big difference in the lives of others. Civility. Compassion. Empathy. Understanding. Generosity. These are the hallmarks of Mississauga. A New Year provides us with an opportunity to reflect on what we have and what are thankful for. I am proud to work with such a committed team of Councillors and staff who all have the best interests of Mississauga at heart. I want to thank each of you and all residents in this great city for their ongoing commitment to making Mississauga a great place to live. As we look ahead, there is much more to be done – we have only just begun. Under our leadership, Mississauga will remain one of the best places to live in the world. By working together, will we take our city to new heights. Happy New Year Mississauga and thanks for taking the time to join us today. I wish you and your family health, happiness, and prosperity.